Another one has gone. So glad to have found someone for this quilt that has been sitting in a cupboard for years. 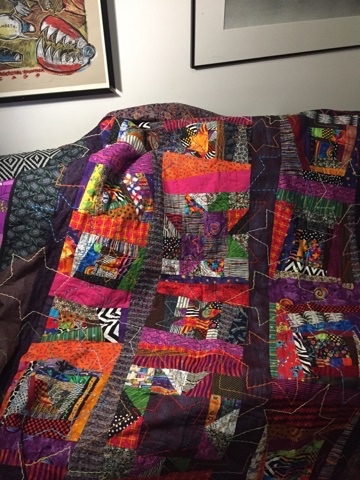 The new owner loves bright colours and bold prints and as it is a generous sized lap quilt it will be perfect for snuggling under on the couch. A somewhat haphazard design of free form eight pointed star and log cabin blocks. The centres of each of the blocks was made with smaller pieces from my scrap bin and then the larger strips attached and squared up to make the blocks fit together. 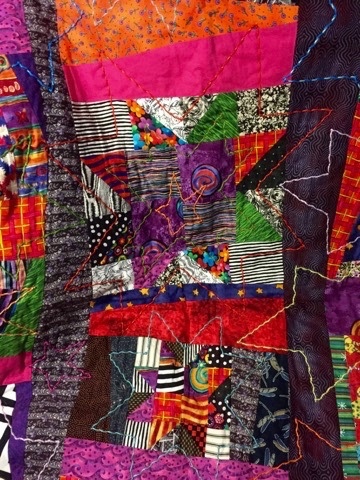 The quilted stars are worked in whipped running stitch using DMC perle thread. Each star was drawn freehand onto the quilt and then stitched, stars are various sizes and arranged to fit around each other.